Guisborough in the North Riding of Yorkshire. At the height of his career as a jockey, he was diagnosed with testicular cancer in July 1979. He was treated with an orchidectomy and with the chemotherapeutic drugs bleomycin, vinblastine and cisplatin, and also had an exploratory operation to identify cancer in his lymph nodes. His victory on Aldaniti was viewed by many as a great triumph, following his previous adversity. Their victory earned them that year’s BBC Sports Personality of the Year Team Award and was chosen as one of the 100 Greatest Sporting Moments by Channel 4 viewers in 2002. Other major races that Champion won during his career include the Hennessy Cognac Gold Cup and the Whitbread Trial Chase. He was appointed Member of the Order of the British Empire in the 1982 Queen’s Birthday Honours. 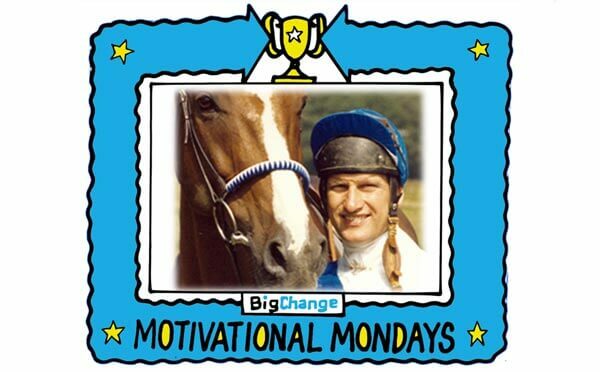 In 1983 he formed the Bob Champion Cancer Trust, which has raised millions of pounds for cancer research. He retired from training horses in 1999. He was the subject of This Is Your Life in 1981 when he was surprised, on his wedding day, by Eamonn Andrews. On 22 December 2011, Bob Champion received the Helen Rollason award as part of the 2011 BBC Sports Personality of the Year competition.